Today I had lunch at the Two Bird Cafe, and looked at the current artist's show of paintings. I was admiring how well she filled all the spaces there, with 24 paintings. I hope to be able to fill the walls as well as she has. 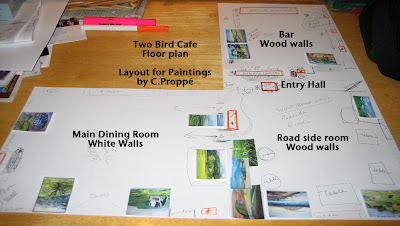 Above is my sketch of the floorplan, and where I have been able to fit in my current paintings. The orange stars/squares represent paintings I am still working on that will fill in the gaps. It looks like I need to create at least 4 more large paintings, and there is the possibility for up to 9 smaller ones as well. It was a very good thing I got in there and measured the walls today, or I might have been making work that would not fit well in the spaces. Also, I wanted to keep specific works together on the same wall, so this was an important day for planning and preparing. It is also time to create and order postcards to send out to announce the show and reception. While I was driving out through the valley, I saw the cows by Spirit Rock today, and wished I had time to stop and paint there. There was nice lighting, as it was partly cloudy. I took a few photos of the golf course today. I plan to include a couple paintings of the golf course in this show. I also saw another plein air painter packing up his car by Flander's Ranch.